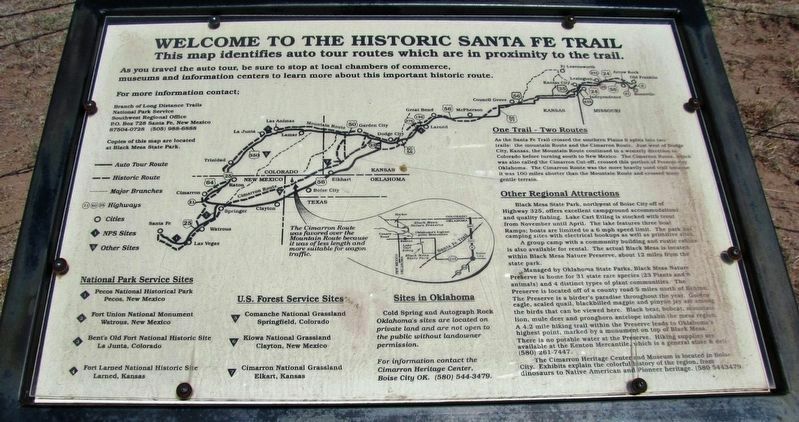 Before you is a portion of the historic Santa Fe Trail. 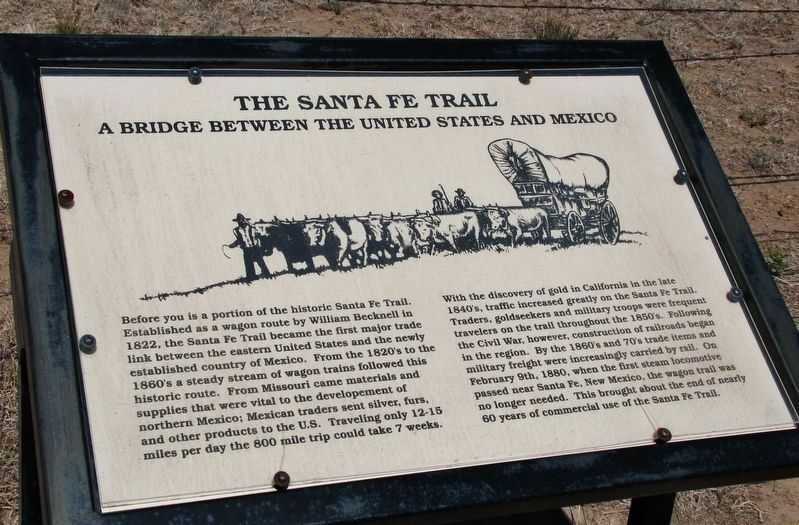 Established as a wagon route by William Becknell in 1822, the Santa Fe Trail became the first major trade link between the eastern United States and the newly established country of Mexico. From the 1820’s to the 1860’s a steady stream of wagon trains followed this historic route. From Missouri came materials and supplies that were vital to the development of northern Mexico; Mexican traders sent silvers, furs, and other products to the U.S. Traveling only 12-15 miles per day the 800 mile trip could take 7 weeks. longer needed. 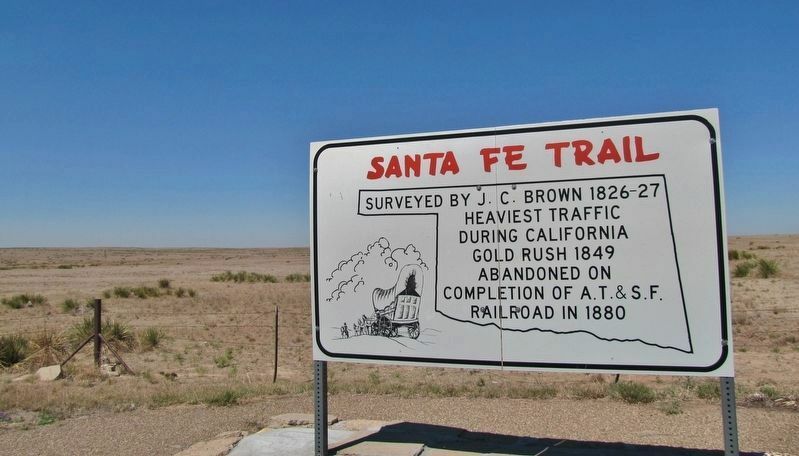 This brought about the end of nearly 60 years of commercial use of the Santa Fe Trail. "I do not want to settle down in the houses you would build for us. I love to roam over the wild prairie. There I am free and happy." 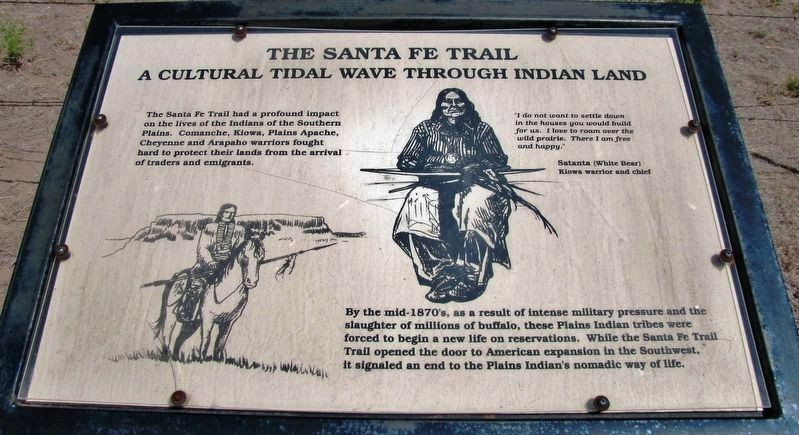 The Santa Fe Trail had a profound impact on the lives of the Indians of the Southern Plains. Comanche, Kiowa, Plains Apache, Cheyenne and Arapaho warriors fought hard to protect their lands from the arrival of traders and emigrants. By the mid-1870’s, as a result of intense military pressure and the slaughter of millions of buffalo, these Plains Indian tribes were forced to begin a new life on reservations. While the Santa Fe Trail opened the door to American expansion in the Southwest, it signaled an end to the Plains Indian’s nomadic way of life. This map identifies auto tour routes which are in proximity to the trail. As you travel the auto tour, be sure to stop at local chambers of commerce, museums and information centers to learn more about this important historic route. mountain Route and the Cimarron Route. Just west of Dodge City, Kansas, the Mountain Route continued in a westerly direction to Colorado before turning south to New Mexico. The Cimarron Route, which was also called the Cimarron Cut-off, crossed this portion of Present-day Oklahoma. The Cimarron Route was the more heavily used trail because it was 100 miles shorter than the Mountain Route and crossed more gentle terrain. Black Mesa State Park, northwest of Boise City off of Highway 325, offers excellent campground accommodations and quality fishing. Lake Carl Etling is stocked with trout from November until April. The lake features three boat Ramps; boats are limited to a 6 mph speed limit. The park has camping sites with electrical hookups as well as primitive sites. A group camp with a community building and rustic cabins are also available for rental. The actual Black Mesa is located within Black Mesa Nature Preserve, about 12 miles from the state park. Marker series. This marker is included in the Santa Fe Trail marker series. Location. 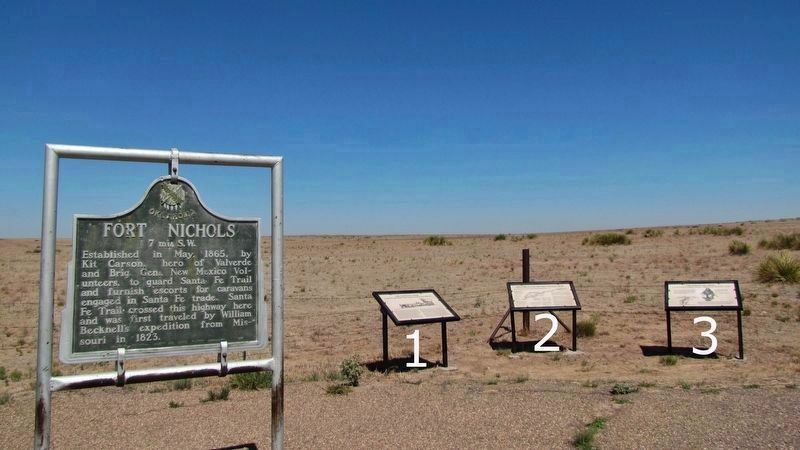 36° 47.204′ N, 102° 48.319′ W. Marker is near Wheeless, Oklahoma, in Cimarron County. Marker is on 325 3.6 miles north of E0190 Road, on the left when traveling north. Touch for map. Marker is located in a pull-out on the west side of the highway, at the point where the Santa Fe Trail crossed here from east to west. Marker is in this post office area: Boise City OK 73933, United States of America. Touch for directions. Other nearby markers. At least 2 other markers are within walking distance of this marker. A different marker also named Santa Fe Trail (a few steps from this marker); Fort Nichols (a few steps from this marker). More about this marker. This marker consists of a set of three related adjacent panels. Also see . . . The Santa Fe Trail (Wikipedia). More. Search the internet for The Santa Fe Trail. Credits. This page was last revised on March 22, 2019. This page originally submitted on March 22, 2019, by Cosmos Mariner of Cape Canaveral, Florida. This page has been viewed 115 times since then. Photos: 1, 2, 3, 4, 5. submitted on March 22, 2019, by Cosmos Mariner of Cape Canaveral, Florida.